We wanted to take you back to your childhood this issue, to a time of endless summer days, freckled noses and daisy chains… plus the excitement of hearing those ice cream van chimes in the distance! Remember the scramble to beg for spare change from the grown-ups in time to join the expectant queue? 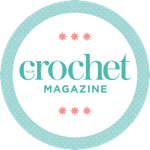 Pick up your free booklet in issue 102 of Inside Crochet, available to order online today.